I like how the word STAR is in capitals!! I bet he never wore that thing. Was just following "procedure" lol. It's all caps (in form, if not in size) except for the i's in MUSiCiAN. Its part of the auction. Looks like Susannah is auctioning off quit a bit. Same for Eric Leeds and Ps costume designer. Were these items prince gave away? How did they get these items. Curious. Crazy Rick couldn't stand Prince! Nice! Thanks for sharing it! Unreal it was so awesome. I'm wondering that too. 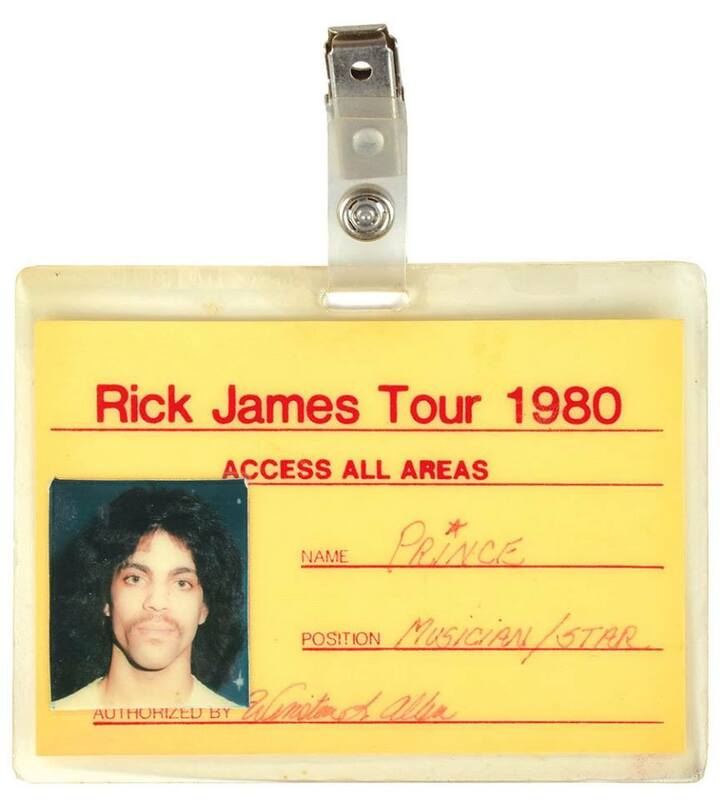 Your old backstage pass seems like an odd item to give a girlfriend. I'm thinking it's stuff he left behind after living with them a bit. I would like to see rick's next to his!! Those braided bangs!!! What a mistake!! Who holds on to someone's nasty azz used leggings for 30 years? Dey was trifling all the way back when too...... I mean, you leave ya sht at my place and don't come get it, I toss it TF out. I don't sit on it hoping to turn a buck some day. Fame is a monster! From the listing: "Remarkable pair of gray knit leg warmer-style leggings worn by Prince during his first-ever solo shows at the Capri Theater on January 5-6, 1979 ... Prince gave these leggings to Melvoin to keep warm during filming of Purple Rain in the winter of 1984." Guess she just held onto them. My guess is he just gave her the jewelry when he was done with it. The art that was "displayed in his Galpin house" is more curious to me. And the lamp from the master bedroom!